Google announced a new method for those who want to create Shopping campaigns on AdWords, via their Product Listing Ads. Google said they "encourage" you to create a Shopping campaign from scratch and then customize your product groups and bids from there. But if you are too lazy and want to take a short cut, Google has a new upgrade path. Now you can base your Shopping campaign on a regular PLA campaign. After setting up your Shopping campaign, you'll be taken to a new page to create ad groups. There will be two options; (1) the ability to start fresh with one ad group or (2) create one or many ad groups based on a regular PLA campaign. 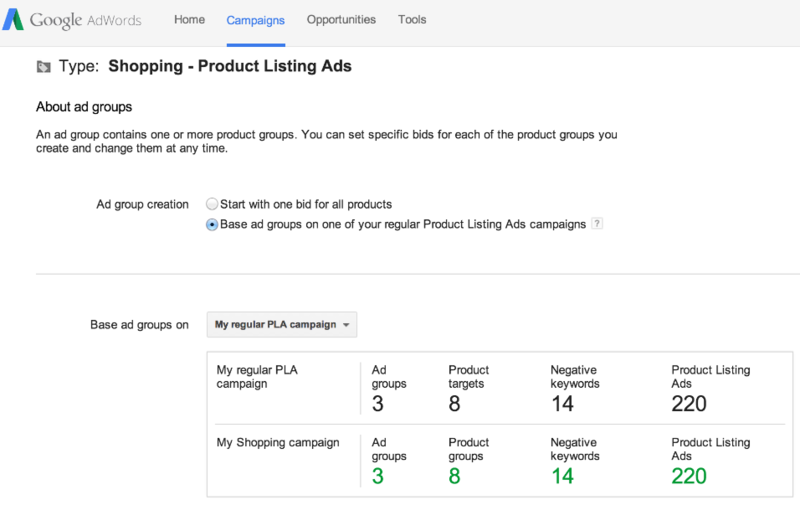 Google is also reminding all PLA advertisers that they will need to upgrade to Shopping campaigns by late August 2014, at which time all remaining regular PLA campaigns will be automatically upgraded.